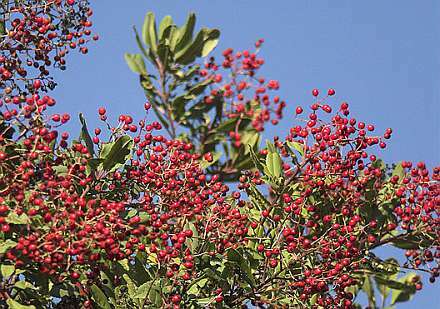 One of California's most deeply emblematic species, Toyon is a large shrub to medium tree with evergreen foliage, a big white bloom in summer, and abundant red berries in December (hence the alternative common name "Christmas Berry"). 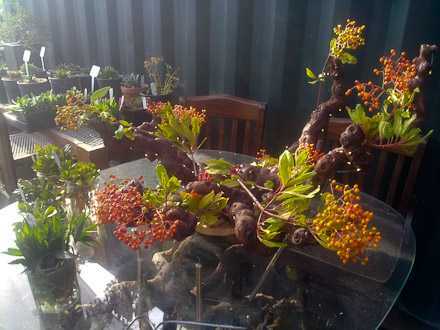 Excellent as a hedgerow or other screen, but also wonderful as a specimen plant or focal point in the garden. 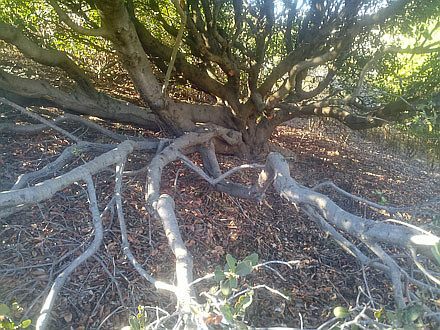 One of the best native species to attract birds and other beneficial wildlife. 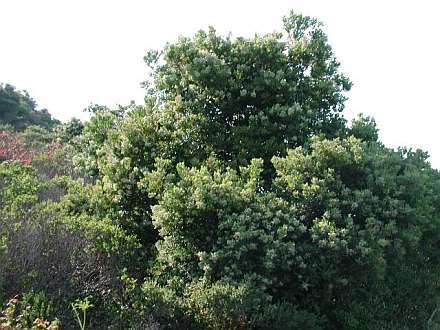 Here's a detailed discussion of Toyon. 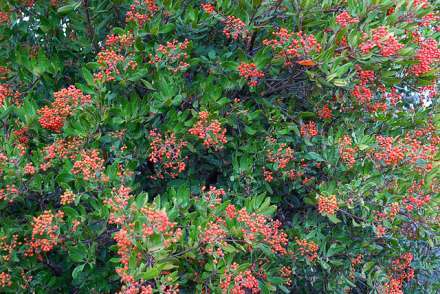 'Sunrise' Toyon has a mix of orange and red, eventually ripening to mostly red. 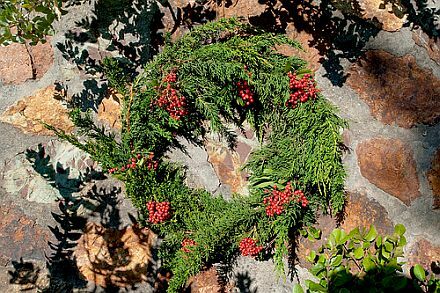 Christmas wreath with Monterey Cypress. 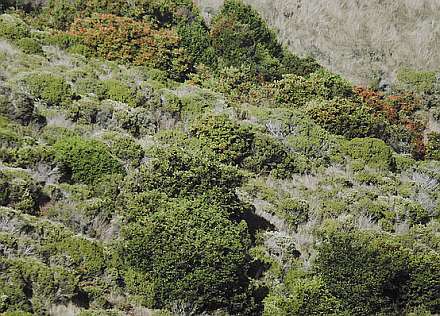 As a chapparall element in coastal scrub on Montara Mountain. In bloom. Subtle from a distance but up close, it's buzzing with bees in a late summer crescendo. 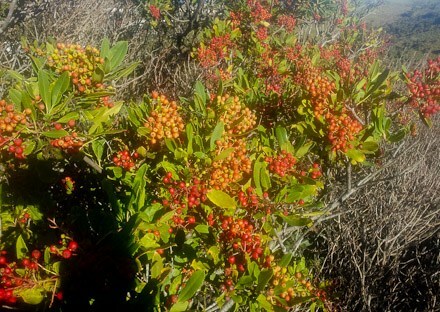 'Sunrise' Toyon has a mix of orange and red, eventually ripening to mostly red. 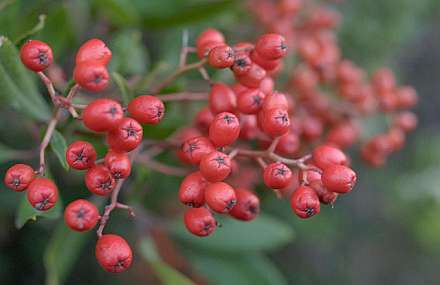 The yellow-berried form has been called var. cerina by Jepson. 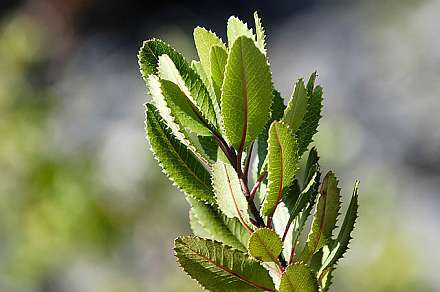 Serration on the leaves varies by population.